Almost square at the halt. Almost. 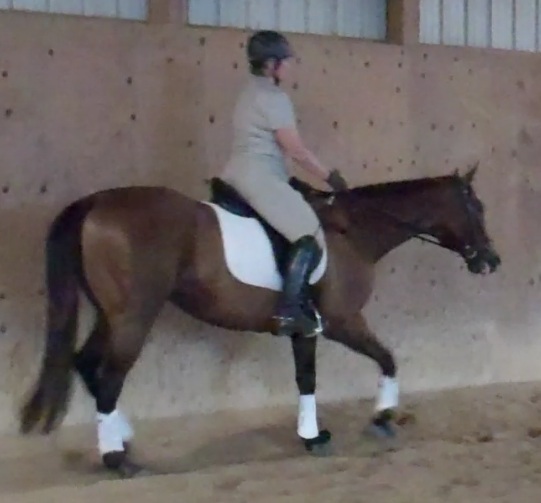 Tonight I rode one of the tests for the first time, and my first run-through illustrated perfectly (for me at least) the purpose of the tests, namely, testing the rider’s abilities to execute a series of movements – many of which complement each other – smoothly and in an organized and deliberate fashion. Do you hear that, Self? Organized and deliberate. While we had a few decent moments, the downward transitions were a bit of a mess. Okay, “bit of a mess” is being generous. They were fifty kinds of ugly, truth be told. Going into the ugly tranistion. 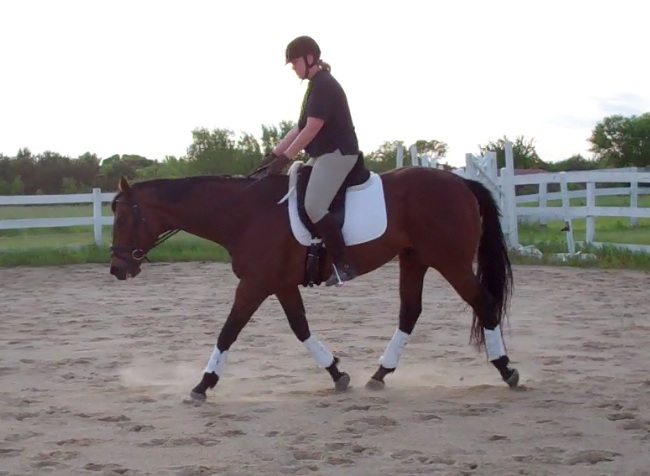 Our trot isn't terrible though he could be rounder and more active. But for us at the moment, this is far from our worst. The ugly transition, in progress. I've started to halt,with no half halts or core engagement to be seen, and I've given Derby about 5 miles of rein. Lovely. But wait. There’s more. Full on ugly. Gaping mouth, hollow back, and he's on his forehand.Yuck! How to rectify ugly? 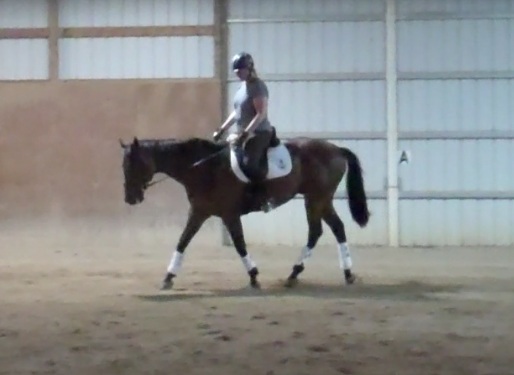 Hold the reins and get busy with your inside leg - at least, you can see this approach starting to work for me here. 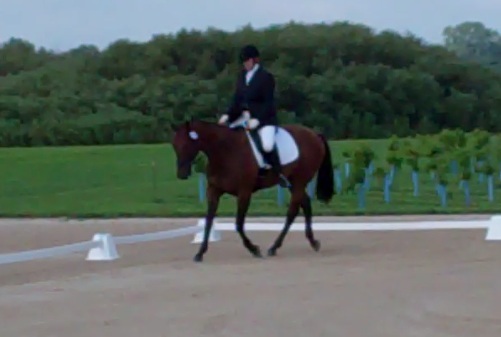 In literally the next few milliseconds, Derby's back is up, and his mouth is closed. Cue Heavenly host strumming on harps. Okay, so that save is nice but it doesn’t do much for me in a test, where transitions are scored. I’m sending a link to this post to Christy and I am sure we’re going to drill this tomorrow. There were some bright spots in tonight’s ride. 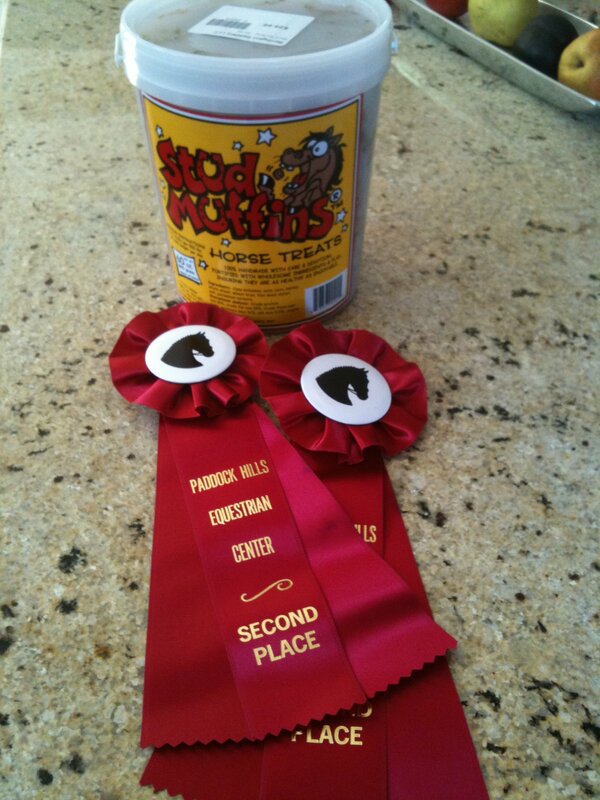 I got some of the nicest trot to date from Derby. His back was way up, and it felt wonderful. All of our current problems can be laid squarely on my doorstep. 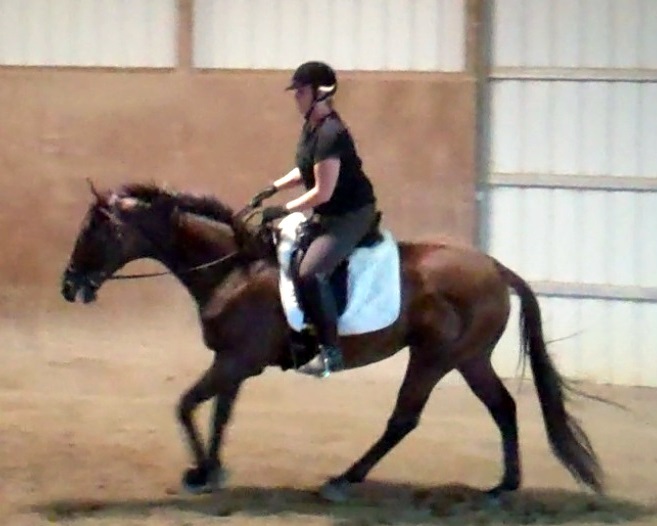 Derby is a sweet, willing horse and tries hard. I like him more and more each day and am really looking forward to our journey together! 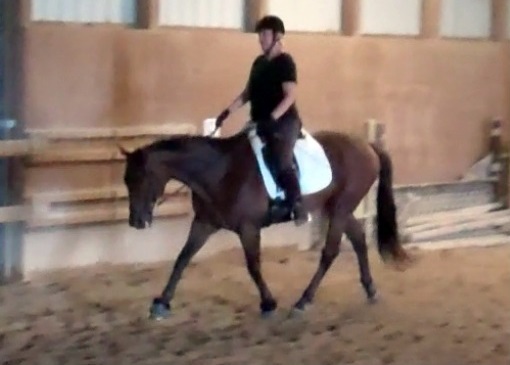 Big news, folks – there’s a wonderful new horse in my life! 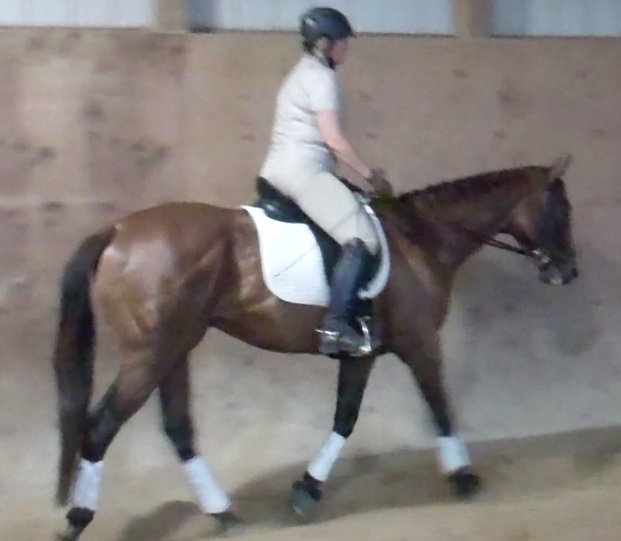 Meet Derby, an 11 year old OTTB that moved in this week. I’m doing a lease-to-buy on this nice boy, and I have to tell you, I’ve fallen hard for this one. 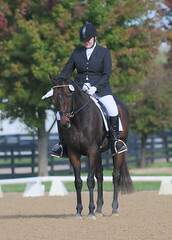 I knew after one ride that he was the horse for me – I felt happy and confident when I went for the test ride. 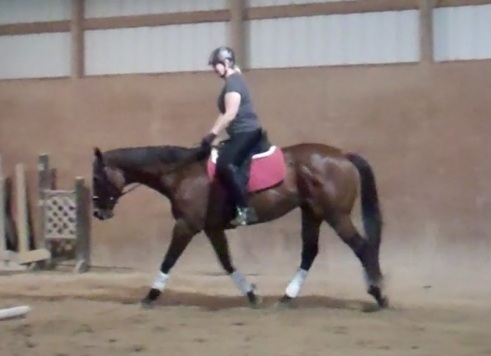 He arrived on Tuesday, and we had our first ride last night – which was totally uneventful. 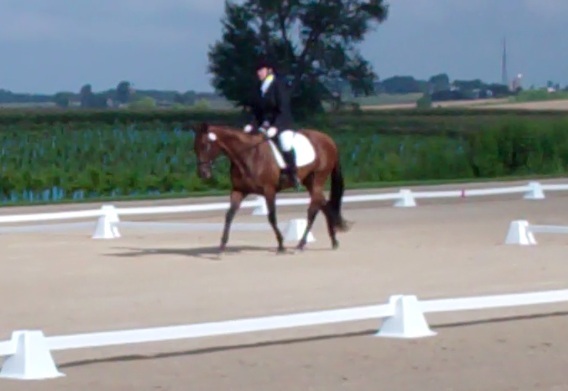 The strange indoor arena didn’t phase him in the least. Tonight we rode outside, and once again, Derby was a total star. Christy took some video of the ride, which, frankly, I’m embarrased to share with you. I’ve been riding so inconsistently lately that my strength and balance are pretty much shot. I feel like a flopping fish and don’t look much better! Derby also needs to get in shape. He was on vacation over the winter, and while he’s in good condition and weight, he needs muscle. So, we’ll spend the next few weeks doing a lot of conditioning work. I also need to regain my independent seat and steady my leg. 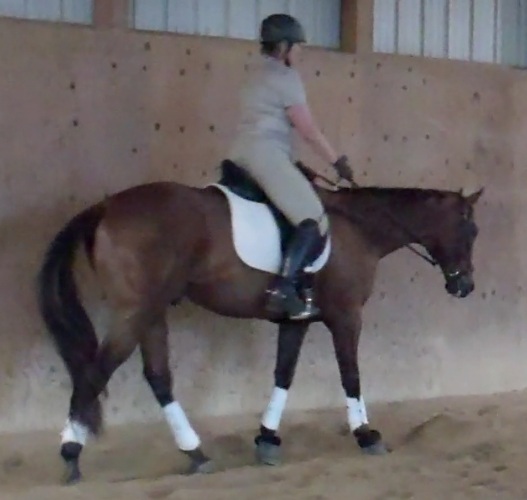 Happily, this is a horse I can see myself doing a lot of no-stirrup work. 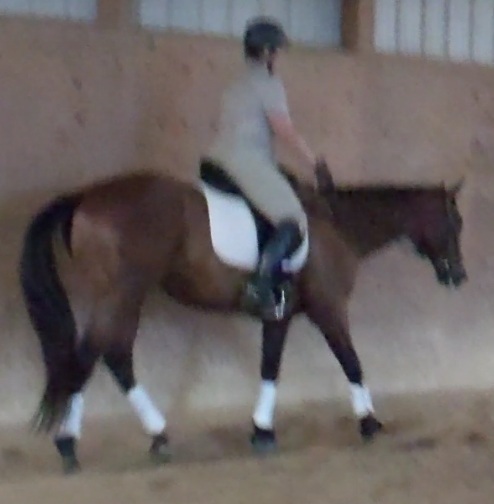 However, before we go there, I want to get Derby’s top line built, and find a saddle that I’m sure fits him well. 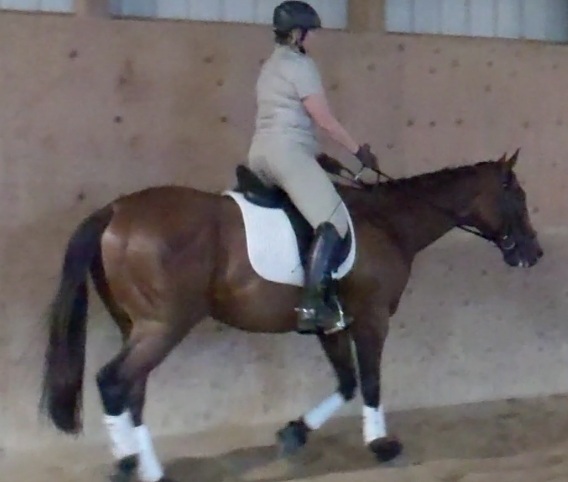 I’m still feeling very out of synch and discombobulated with Derby, but we have had some nice moments that leave me eager and impatient to get over this conditioning hump and get my riding legs back. I also need to figure Derby out. He has a lot of training but is very resistant to contact. 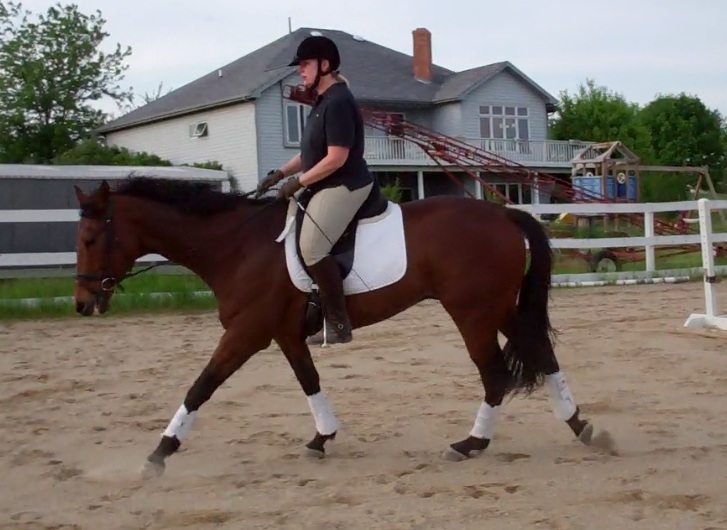 You can’t just push him into the outside rein and get to work. He needs to warm up on a loopy rein. Actually, given the current state of my riding, this isn’t a bad thing. 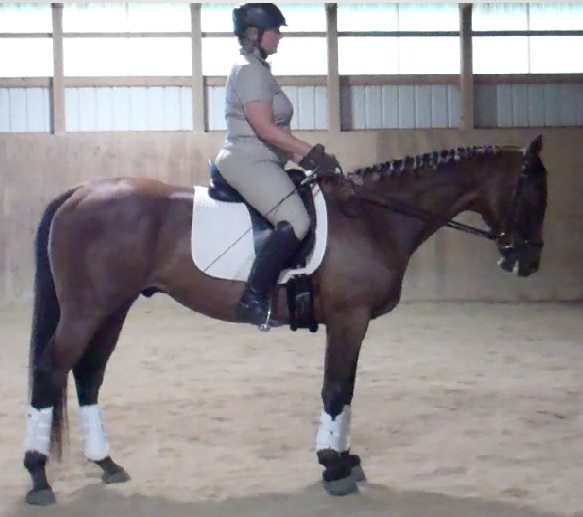 Riding with pronounced loop in the reins forces me to use my legs and seat to influence the horse. And once I put him to work, Derby is much better about accepting contact. I’m pretty sure that once I get my strength and balance back, my hands will be steadier and more independent, which will help Derby too. 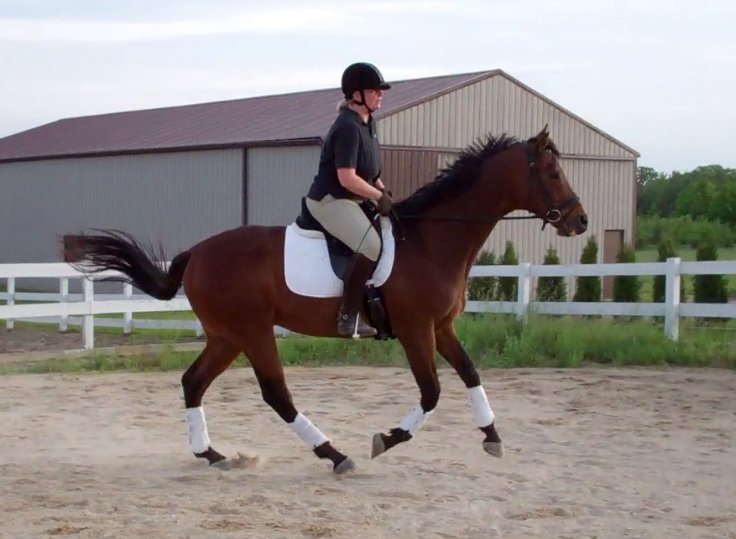 For now, I love the fact that this is the sort of horse that can go around on the buckle in a new environment. He is the very soul of a good boy, and I’m crazy about him. 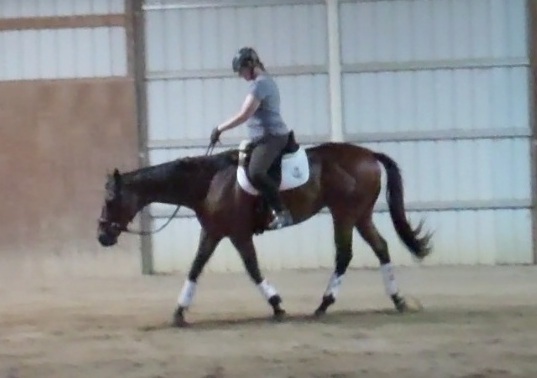 Before my energy totally waned, we got some nice canter both directions, but not before I had to send Christy back to the barn for a whip. Derby is very responsive to voice aids – a chirp will send him forward, but I’d like him to be lighter and more responsive to my legs and seat, and I’ll be making that a priority over the next few weeks. We finished up the evening with another grooming session, hand grazing and cookies. 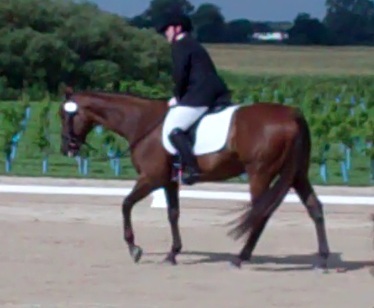 I’m beyond thrilled with this sweet, fancy horse. Next ride should be on Saturday. Stay tuned!